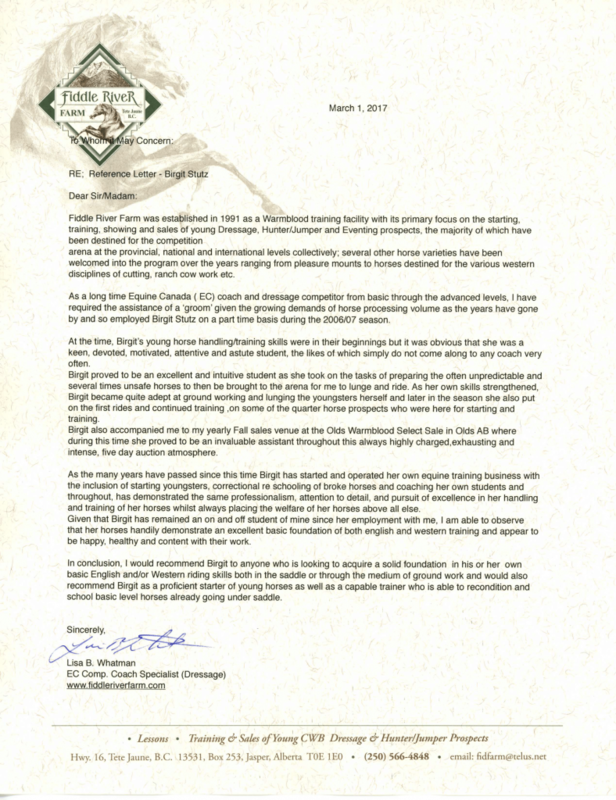 Birgit Stutz, the owner of Falling Star Ranch Academy of Foundational Horsemanship, is an Irwin Insights Level 4 Master Certified Trainer (Chris Irwin). Birgit has over thirty years of experience in the horse industry and is proficient in both English and Western equitation. She has trained horses and coached riders for more than a quarter century, since 2006 professionally, developing and refining her methods over the years. 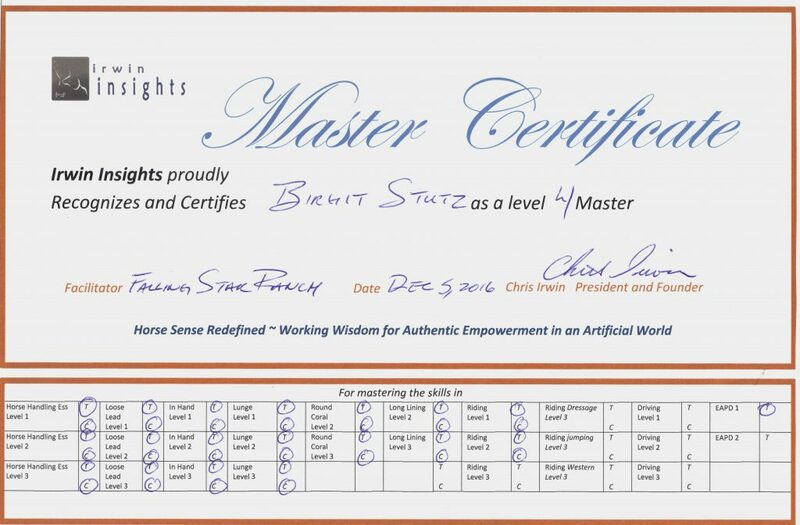 Birgit was the first Irwin Insights trainer in Canada to be awarded Level 4 Master Certification by Chris Irwin (on December 6, 2016), and she has been mentored and certified by world-renowned horse trainer and clinician Chris Irwin since 2006. Birgit has coached over a dozen students to certification with Irwin Insights, as well as numerous students to levels eligible for certification with Irwin Insights. Birgit’s extensive knowledge, passion for coaching and attention to detail is evident in every lesson. 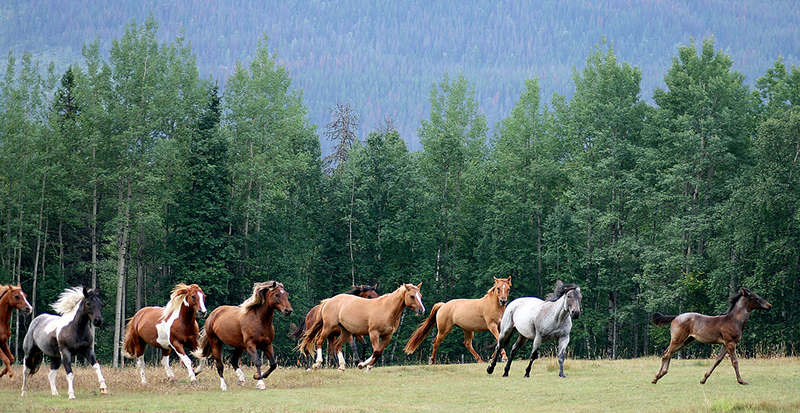 Several of Birgit’s students are now successful in the horse industry in various capacities. Over the years, Birgit has also started numerous young horses and successfully restarted just as many horses who either had a bad start or developed issues over time. Birgit believes strongly that every horse is an individual and that the secret to unlocking its full potential is reached by putting the needs of the horse ahead of the handler in every context. 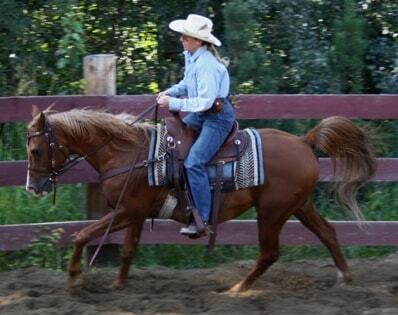 By doing so she has many times produced amazing changes in horses and as a result in their humans too. Birgit’s most important teachers throughout the years have been the horses. 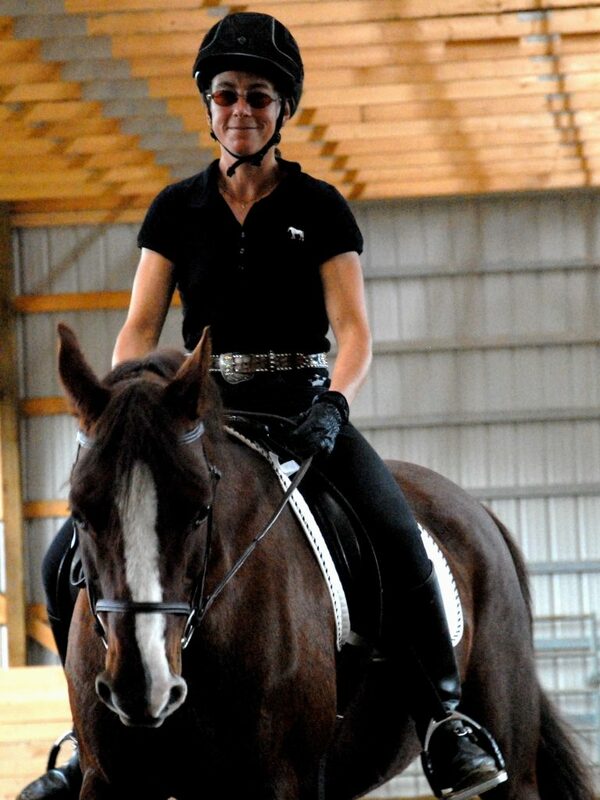 Horses have taught her that being a great horse person goes beyond loving horses and being an excellent rider. A great horse person strives to understand and relate to horses using the horses’ own language, equine body language. Over the years, Birgit has worked with all kinds of breeds, from quarter horses, paints, Arabians, Warmbloods and Thoroughbreds, to Morgans, gaited horses, draft crosses, ponies and various mixed breeds, and has learned something from every one of them. Birgit is completely devoted to horses. She stands behind her personal convictions and places everything secondary to her concern for the horse. Birgit trains, teaches and coaches at her Falling Star Ranch Academy of Foundational Horsemanship in Dunster, British Columbia. Upon request, she also travels to clients for lessons, coaching, demos, workshops and clinics. Born and raised in Switzerland, Birgit studied journalism, English Linguistics, English Literature and North American History at the University of Zurich and received her bachelor’s degree (Licentiata Philosophiae I) in 1997. Her love for horses began at an early age. However, it wasn’t until she entered high school that she started taking English riding lessons at a well-known riding stable in Zurich. At that time, Western riding was still fairly new in Switzerland, and Birgit was only minimally exposed to it. But during a year and a half long stay in North America in the early nineties, Birgit learned more about Western riding and Western horses. Upon her return to Switzerland, she bought her first horse, Machlon, a then six-year-old Russian Arabian gelding with a lot of “issues”. With lots of patience, love, and understanding, Birgit turned him into a reliable riding horse. In June 1998, Birgit immigrated to Canada, taking her then 10-year-old Arabian gelding Machlon (who sadly passed away in September 2014) with her. 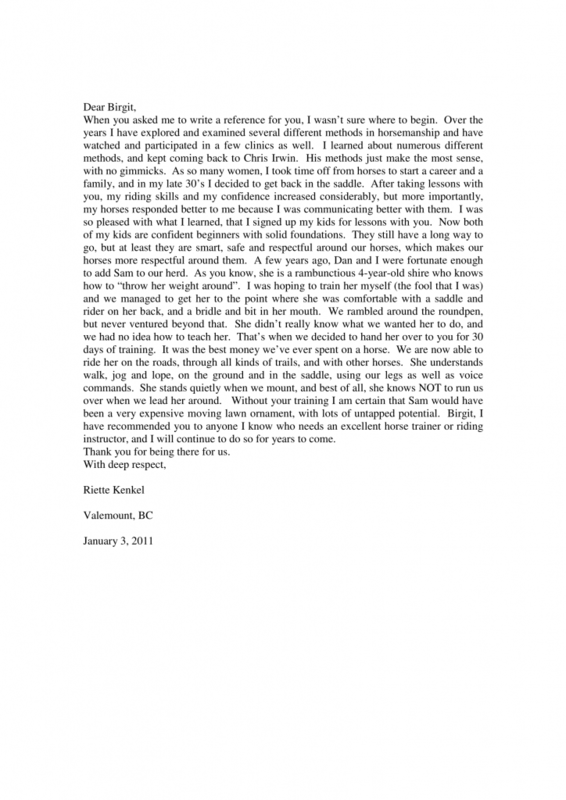 Birgit worked in various horse jobs, as a trail guide, as barn help, as well as a groom and assistant trainer for an Equine Canada competition coach specialist (dressage). Birgit is also a freelance writer as well as a published author. Check out her book “The Rescue of Belle and Sundance, A Miracle on Mount Renshaw”. Birgit has owned and trained her own horses for over 30 years, and during that time has also trained outside horses and taught riding lessons in both Western and English style in her spare time. In 2006, Birgit took the leap and decided to turn her love of horses and her passion for teaching and training into a full-time equine business, training horses and teaching and coaching riders from beginners to advanced in ground work and riding, in both Western and English style, with an emphasis on good horsemanship based on equine communication, psychology, and biomechanics, as well as the principles of classical dressage. Birgit enjoys working with people who have a love of horses and who would like to truly understand horses and build a relationship based on confidence and mutual trust and respect. Birgit is continually updating her knowledge and furthering her skills by riding and working with a variety of horses at different ages and stages of training and of various dispositions, and by attending clinics and workshops with various trainers. 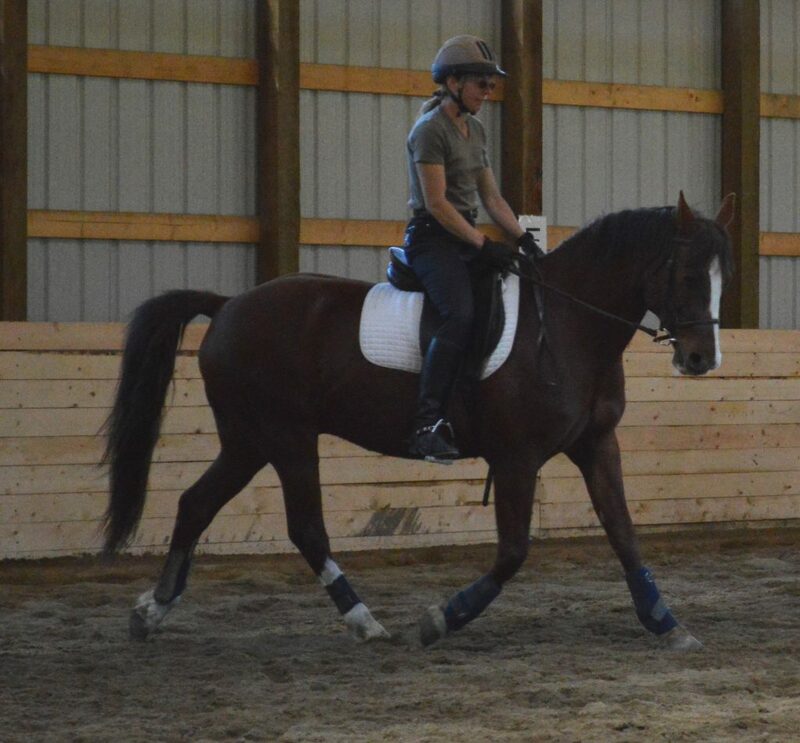 She also takes dressage lessons with an Equine Canada Competition Coach Specialist as well as with a Centered Riding Coach on a regular basis. And last but not least Birgit further continues to study and keep up-to-date on horse care, horse health, nutrition, as well as various other horse-related topics through reading and participating in online workshops. Birgit was the first Irwin Insights trainer in Canada to be awarded Level 4 Master Certification (on December 6, 2016), and she has been mentored and certified by world-renowned horse trainer and clinician Chris Irwin since 2006. Experience working with all kinds of breeds, from quarter horses, paints, Arabians, Warmbloods and Thoroughbreds, to Morgans, gaited horses, draft crosses, ponies and various mixed breeds. Experience working with all ages of horses, from foals to geriatric horses, as well as with horses of various temperaments, from laid-back and lazy, to stoic-defiant, to sensitive and hot. Birgit also has experience working with abused horses, “problem” horses, disrespectful and pushy horses as well as green horses and stallions.